i was fiddling with tomb rider and found strange thing, the full version ,it run well on v12 with 3dfx patch, then i run the normal version using virge dx, and screen crashes, game still working in the background but screen is as on provided picture. any way i can use win key and close the game, try run again and it do the same. then restart and run the standard full version and it works fine first time, then close and run 3dfx , it runs ok. then close 3dfx and start normal version and screen crashes again , untill i restart or maybe run different app, didnt try. looks as if always after running 3dfx version the normal ver. does crash. and when i close the 3dfx ver. on windows , without using game menu and start normal version , screen crashes as well but i could see 3dfx game frame. maybe something with buffer? i thought it might help. any way when i run normal ver first it works fine, its not a problem at all. i run it on win98 and both 3dfx and normal are working, just the strange screen problem with normal version after running voodoo ver. did'nt try the demo. dont have demo. UPerschke wrote: Tomb Raider 3DFX demo (tomb3dem.zip) crashes PCem V12 right after DOS/4GW + blank screen. Can't test with full version since I don't have it. Happens with both Voodoo interpreter and recompiler. Interesting, not seen anything try to read that register before. Can you link to the exact demo that you're using? Actually the same file. This demo is available on numerous web sites. File name varies a lot, file date a bit. File size imho is a reliable parameter (2,310,970 bytes). I downloaded it from around ten sites for hash comparison of zip contents, just to make sure it's the same through all of them. the same file here as well http://download.cnet.com/s/tomb-rider-game/ and it also crash, full version didnt crash. A. Naim wrote: Interstate '76 Nitro - Clicked on "3Dfx" on the startup screen, and immediate Crash to Desktop. What info do you need, and how would I get it? Update: Installed and drove around a bit with 3Dfx, 640x480 only. No problems detected. System Shock 2 runs particularly poorly on the current CPU emulation. Rev 647 fixes the Tomb Raider demo. I've tested Network Q RAC Rally Championship (aka Rally Championship '96, almost the same graphics engine just like International Rally Championship) and TOCA Touring Car Championship. These two games works very well and without any glitches. PS: Not only me have problems with dropping FPS in Colin McRae Rally? Last edited by Ryszard on Mon 27 Feb, 2017 9:20 am, edited 2 times in total. as far as I can tell only issue is my weak hardware lol. Since I was only getting about 75-80% speed. Did not seem to respond to changing the the settings in the game. I suppose I should have expected that last bit since that does not change the hardware I am trying to emulate. I think this can be updated - map is now rendered perfectly fine. Also, Sports Car GT works fine, no compatibility problems at all, apart from Voodoo 2 not being enough for this game . Last edited by Greg84 on Sat 17 Jun, 2017 9:19 am, edited 1 time in total. Actually I think the main list is very out of date. I'll refresh it when I come to do testing for v13. SarahWalker wrote: Actually I think the main list is very out of date. I'll refresh it when I come to do testing for v13. - Works with some bugs. True - but just for my curiosity: for all or only W9x 3DFX games? Unlike PS2 emulators (I guess because I never used any), PCem emulates plenty of platforms with different configurations, not mentioning whole guest OS with drivers installed. That's plenty of data per title and possible false negatives because of that - at the other hand - peer review should handle this . 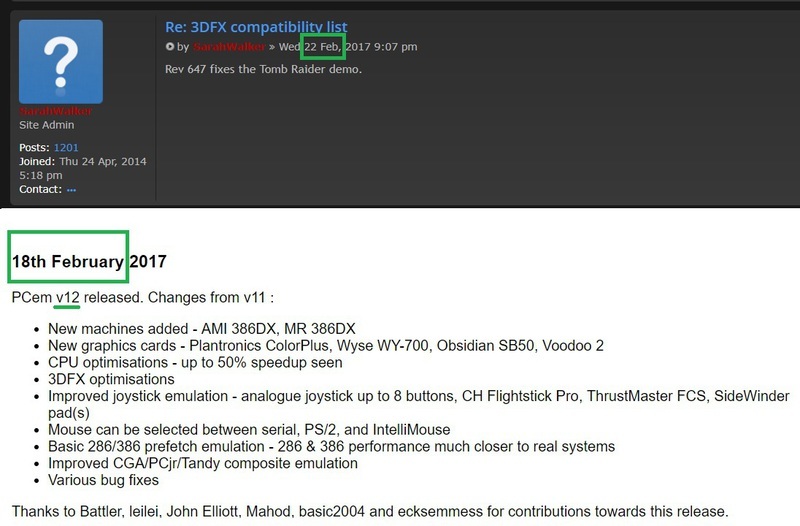 With various driver versions and regressions 3dfx themselves did among their Voodoo Graphics and Voodoo2 cards, it wouldn't be as elegant as PCSX2's compat list (or any console emulator's list) that's for sure. Not a game, but if you need to relax abit, Voodoolights screensaver works under Windows95. King's Quest: Mask of Eternity loads and looks really good, but it runs dreadfully slow even with minimal graphics settings, 640x480 and shadows and dynamic lighting turned off. Amazingly, I'm getting 100% performance on Mobile Pentium MMX 300, but again very slow. ndavis82 wrote: King's Quest: Mask of Eternity loads and looks really good, but it runs dreadfully slow even with minimal graphics settings, 640x480 and shadows and dynamic lighting turned off. Amazingly, I'm getting 100% performance on Mobile Pentium MMX 300, but again very slow. I tried both Voodoo 1 and Voodoo 2. The game defaulted to 3Dfx. I even tried it with both Windows 95 and Windows 98 SE. Nothing ever made any difference. Jane's WWII Fighters will take the emulator down with it in 3dfx Glide on Voodoo2. Fixed in rev 841, and rev 842 fixes the texture issues in the game. SarahWalker wrote: Rev 647 fixes the Tomb Raider demo. Hello Sarah, in PCem v12 that Tom Raider 3Dfx Demo crashes ... therefore I think, the problem is still (or again ?) unsolved. Or anyone out there, where the that demo runs well on PCem v12 ? Thank you for the info. Nice to see the constant progress in development of PCem ... keep on the good work ! I tried Need for Speed High Stakes and Porsche Unleashed/2000 with PCem v12 set to emulate a Pentium MMX 200 and a Voodoo2, both seem to render correctly, although the latter is rather slow (which is to be expected I think). I also tried running MiG-29 Fulcrum, but a large part of the scene is dark. I tried turning the emulated processor down to a Pentium MMX 166 to no effect (other than less sound stutter). It showed the 3dfx logo animation when it starts, so I believe it is running using Glide. Below is a screenshot of the issue. And, I tried 3DMark99 MAX and 3DMark2000, no glitches that I can see. I'm running PCem (which has Win98SE running) on a laptop with a Core i7-6700HQ and Windows 10 version 1703.